The Open Borehole dialog box allows you to specify which borehole file to open. To display this dialog box select the Open Borehole command on the File menu or click the Open Borehole toolbar icon ( ) or press the Ctrl-O shortcut key. The appearance and content of this dialog changes depending on your operating system. A typical example for Windows XP is shown below. File Name: Specifies the file you want to open. This box lists files with the extension you select in the Files of Type field. Prolog version 2.1 and version 3.0 files. These files do not have a specific extension, so all files are displayed by default. Prolog version 4 files (*.prolog). Comma Separated Value files (*.csv). 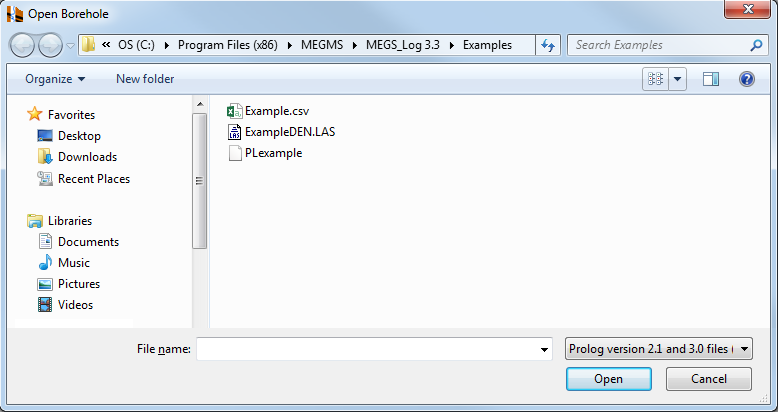 Other buttons and fields within the dialog box allow you to navigate through the drive and directory structure of your computer to the location of the borehole file; to change the way the files are displayed within the dialog box and to carry out some basic file operations. Details vary depending on your operating system.